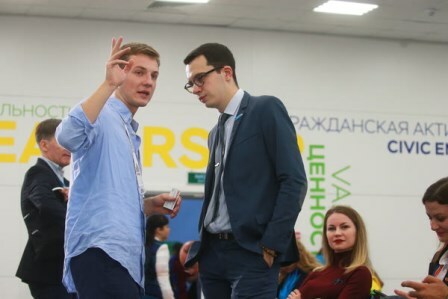 Two volunteers of Opora have participated to the 19th World Festival of Youth and Students (WFYS) which took place throughout Russia and in the seaside city of Sochi from 13th till 22nd October 2017. The WFYS is organised by the World Federation of Democratic Youth together with the International Union of Students. It is a tradition inherited from the former Eastern Bloc and many festivals have been organised in countries that were allied to the Soviet Union. The first festival was held in Prague in 1947. In 1957, Moscow hosted the 6th Festival, with about 34.000 participants from more than 130 countries. Today, the Festival has gone further away from the socialist-communist ideology to constitute a giant platform for youngsters for all around the world to meet and participate together in sports, cultural, technological and political events. 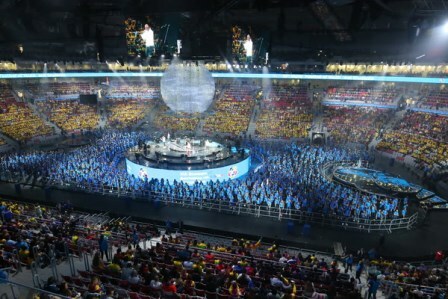 This year, for the 19th edition, it gathered about 30.000 participants from each and every Russians region as well as representatives of the participating countries, which were hosted together in hotels near the Olympic Park of Adler, near Sochi. A few more thousands of Russian volunteers from all over Russia also volunteered to help the participants at the venue of the Festival. Aleksandra was part of the delegation of the Mari El Republic. She attended different lectures and seminars on the topics of the fight against HIV/Aids, successful management and the relation between culture and freedom. She got acquainted with the speakers and got many ideas for new projects for Opora. Arthur participated as a representative of the French national delegation. He took part first in the regional programme “Discover Russia” which took him for four days of cultural immersion in the Republic of Dagestan. Then in Sochi, he attended many cultural events, concerts, master-classes, and got to know more about the different Russian regions. The festival did face some organisational issues; however both our participants were marked by positive impressions, having learned a lot about Russia, social opportunities and having met new friends.